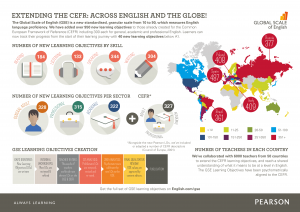 After reviewing existing learning objectives and identifying gaps, new learning objectives are reviewed and refined before being rated by thousands of teachers worldwide on the GSE and CEFR. The learning objectives then go through two rounds of data analysis by our psychometricians in order to calibrate them to the GSE. Any problematic learning objectives are removed, and the final list is checked again by content editors before being published. Who are the teachers that do the rating? We’ve collaborated with over 6000 teachers from 50 countries to create the GSE Learning Objectives, and reach a shared understanding of what it means to be at a level in English. 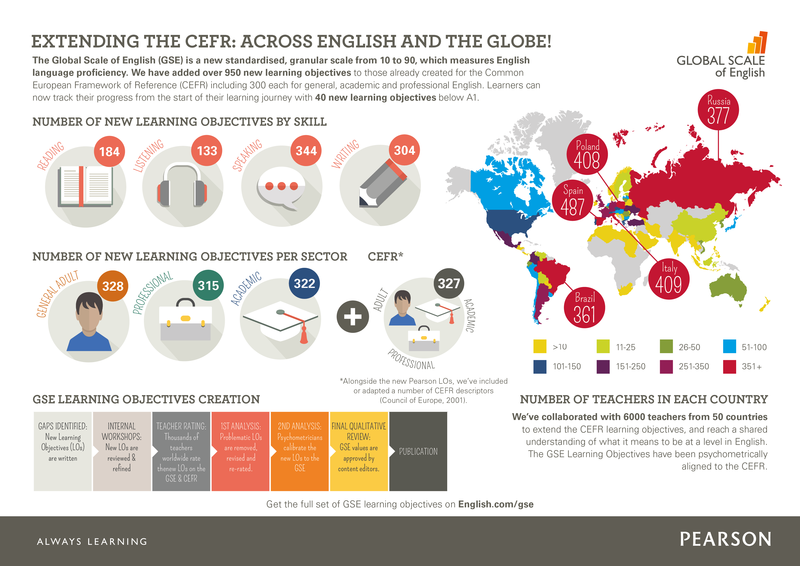 The GSE Learning Objectives have been psychometrically aligned to the CEFR. Of those 6000 teachers, these include 487 in Spain, 409 in Italy, 408 in Poland, 377 in Russia and 361 in Brazil. How many new learning objectives have been added? In addition to these new learning objectives, we’ve included and adapted 327 CEFR descriptors (Council of Europe, 2001) with kind permission from the Council of Europe. 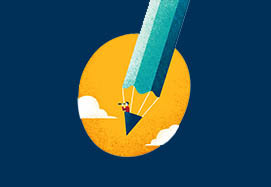 Download all GSE learning objectives today. This entry was posted in English for Specific Purposes, English language, Onine resources, Pearson and tagged Global Scale of English, GSE, online resources, Pearson by Manuel Caro. Bookmark the permalink.